The summer is full of so much abundance. We freeze, can, dehydrate, ferment, and more to save that plenty for leaner months. While I appreciate the weekend spent to putting up salsa, canning peaches, and making pickles, there is something to be said for doing up a few small bits of creative preserving. Small bits like this lavender infused sugar. 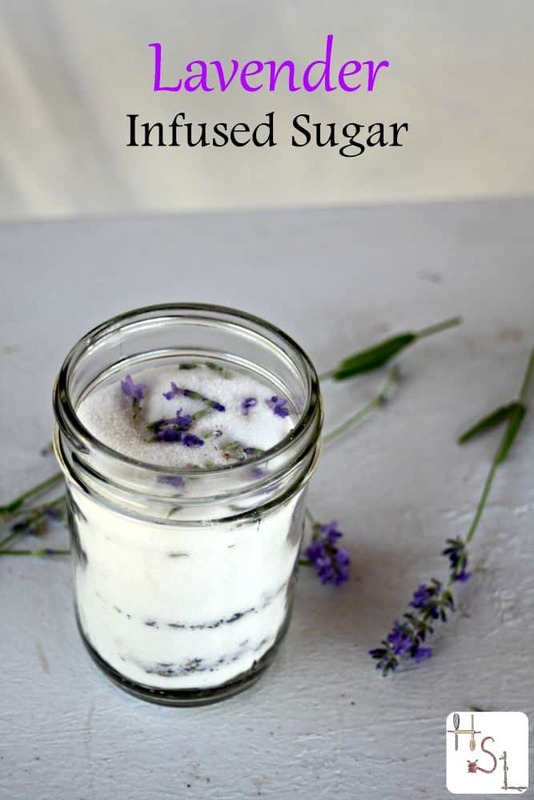 This is a quick and easy project that makes use of that fresh lavender in the garden or picked up at the farmer's market and turns it into something sweet and delightful for the winter months ahead. Harvest lavender flowers when they're open and dry. Strip just the blossoms from the stems. You'll need 3 Tablespoons of fresh lavender for this sugar. Grab 1 Cup of sugar from the pantry. In a clean glass jar, sprinkle some sugar into the bottom. Sprinkle a few lavender blossoms, then layer some more sugar on top of that. Alternate layers until all the sugar and lavender blossoms are inside the jar. Place a lid on the jar and put in a cupboard for a month. Shake the jar when you remember to mix it up and keep the flavor infusing. At the end of a month, the sugar should be full of lavender flavor. As sugar is a preservative the lavender blossoms are completely preserved and dried in the sugar, there is no need to remove them from the sugar. In short, use infused sugar as a replacement for plain sugar. Lavender infused sugar is particularly nice when used to sweeten hot black tea or cold lemonade. It's delicious sprinkled on top of cookies, scones, and muffins. The lavender blossoms give a beautiful color and look as a bonus. Use it in jams and jellies for an additional depth of flavor. Lavender and caramel make a great combination so use the infused sugar to start the caramel making process. Before all those beautiful blooms fade this summer, harvest some and whip up a quick batch of lavender infused sugar and get creative with it this fall and winter. I’m so glad I found this post! I bought 2 lavander plants this year and I wasn’t sure what I was going to do with them besides look at their pretty flowers. I’m definitely going to make some lavander sugar and make some fresh lemonade with it! Thanks. Can you use dried lavender? I’ve never tried it. I imagine you could but the flavor would be lighter. The thing about fresh is that the sugar pulls a lot of the moisture and flavor from the lavender. Hi Katie, will any type of lavender work? I live in a hot, humid climate where the wonderful french lavenders will not grow. I grow Spanish lavender, more of a bulbous shape with two or three purple petals protruding from the top. If only the petals can be used this type would not produce much of a bounty. Can the bulbous part be used with Spanish lavender? Any would work as long as the lavender tastes good (some types can be a little bitter). I’m not sure about the bulbous part but I’d give it a try in a small jar and see what happens. How long does infused sugar last? I would use it up within a year.